Is a reasonable move? If not, where should be played? What white move does Bass fear, after ? Moves 88-95+. The whole sequence is rife with possibilities. Was 112 better at F2 or G1? Antone: Question: in the following position with white to move both 'a' and 'b' were suggested but discarded because of shape reasons. The selected move was 'c' but Herman said that he would have preferred 'd' (because it's lighter I think, but that's beyond the scope of my question here) Can someone explain to me why c and d are better than a and b ? I would have thought that a and b create miai positions, if black plays on one side white will take the other and still have good shape, is this not the case ? If so would 'e' and 'f' also be better than 'a' and 'b' ? ThorAvaTahr: For shape alone 'e' and 'f' are better than 'a' and 'b' in my opinion. I think that the relation of 'd' to the white position on the right is important and that the idea of 'd' is to tempt black to exchange 'g' for 'h', which is profit for white. I also think that if you would search for a move in the direction of the left side 'i' would be the first to look at, however, this leaves a large gap in the position. Of course I like Myungwan Kim's suggestion best ('j'). From the game position, there is only one cutting point, and if black cuts, white can choose to either sacrifice a single stone with 'a' (it's a fairly light stone) or fight with 'b'. Both seem to be satisfactory for white, so this cut is nothing to be afraid of now. So, concluding, the game move is better shape because it leaves only 1 cutting point behind, whereas the other move leaves behind 2 cutting points. 'e' and 'f' also seem to be better than 'a' and 'b', for similar reasons. 15: Way too small, should be at R7. 17: D6 is better. Make use of move #9. 19: The top and right sides are miai. R8 looks good, as does K17. But either one allows white to play a 6-3 approach to the corner. So treat the sides as miai, and take O17 now. 33: P12 is best, prevents white O11. 36: O17 is best, threatens Q18. 57: b14 is still bigger, b8 second best. 72: Hane at 73, then extend. emeraldemon: There are some interesting endgame sequences in the game, I think it would be worth it to go over them and try to figure out the best play and maybe even the miai value if we can. White has fallen behind after the reduction of the black framework at the lower side. Black played too passively during the endgame, allowing white to catch up and overtake black. I think these two aspects deserve further review. tapir: I don't believe keeping the whole moyo when you take gote twice to close both sides is something to be necessarily proud of. I feel white got the better result especially with W114 over B113 and probably with over (settling and creating cutting points as opposed to taking territory), black played big moves twice, white moves involved life and death issues both times. That is why White got so many sente moves later, imo. White missed some opportunities in the upper right as well. ThorAvaTahr: I don't agree, in my opinion white has been ahead the whole game. Sometimes more clearly so than at other times. Also I think that you don't correctly judge the endgame situation in the lower left corner. 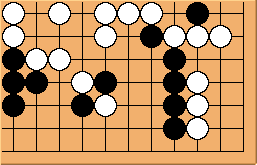 White does not incur any loss there, black can capture the ko first, but that's all. 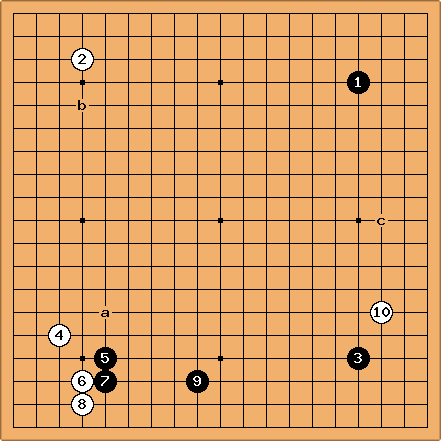 This way white gains over 7 points in double sente. kanzenryu: As one of those who recommended I'll just say I thought we were trying hard for some gain at the time ;-) At the I thought we were simultaneously fighting to save the central back group and also to attack the white group below. I'll just add that I had a sinking feeling when we lost all four corners. unkx80: With respect to my second point, I find it curious that white is able to get a number of large endgame moves such as W116, W126, W136, W138, W142, W148, and W156. I thought that black should have created opportunities to play on some of them. kanzenryu: BTW I've submitted the SGF to the GTL for a review. I think it might be really interesting to get a review from a strong player who was not involved in the game. tapir: kb commented that he want to make a review of this game and isn't participating because he wants to be unbiased in the review. kb: I've noticed that the game has ended. Here is my review so far, through 80 moves. Please feel free to make comments on that page; when it is finished, I will incorporate the whole thing here. kanzenryu: kb, that's awesome. I'm looking forward to seeing the rest of it. tapir: thank you for the review so far kb. the next moves are what i am most interested in - like these were the turning points of the game. after i felt like we are very much behind, but felt good again, it seems to be crucial (how would the game have gone if black plays there first instead of taking the corner?) and i am interested what happens with cutting instead of defending. i felt like black made some wishful reading in the sequences given on the black page as reason why white's cuts don't work. can we make an integrated review with all high dan comments collected in one page? unkx80: I played all the White moves from through . Here is my review on some of the moves in this sequence. was too deep. I prefer a reduction at around K8. feels unusually strong. I missed this move completely. The and exchange is particularly loss making for white. White should have played directly at . 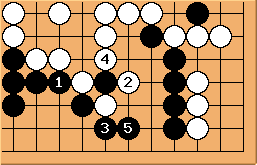 If black played outside, then white can enter at N3. 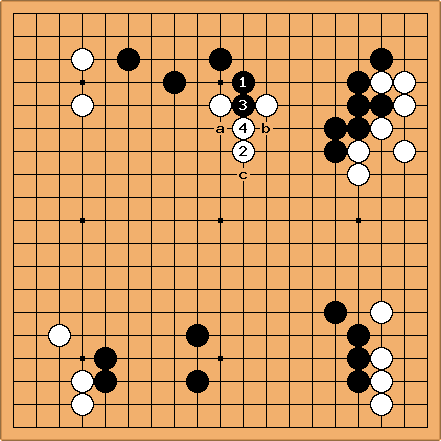 If black played at , then white can choose to play at L9 or N9, much more efficient than at . is unusually large, but at what price? For those who did not read it out, the real value of is that it prevents white from entering at N3. With N3, white can either connect out or live unconditionally inside. is better played at . I was too worried about the eyespace of the white group. There is also a question being asked about the timing of . As it turns out, black decided to sacrifice. If black had chosen to fight it out after , then there is a distinct possibility that the chain will become heavy. In this case, it might be too late to come back to atari at , because black might then go after the heavy group instead of connecting.